Brown fur with bright green eyes, always wearing a mischievous smile. 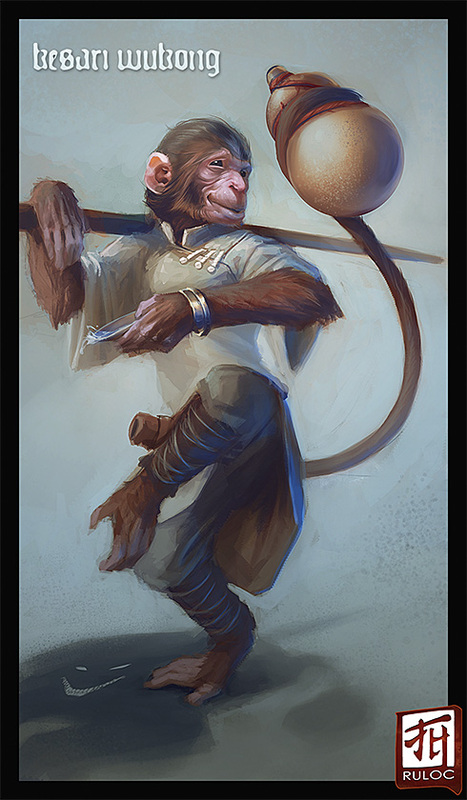 Kesari is a self-proclaimed drunken master, and Avatar of Sun Wukong - god of drunkenness and trickery. He wears very simple robes that bear the holy symbol of Sun Wukong on its back, carrying a walking staff in one hand and a large gourd (full of rice wine) with his prehensile tail. It would be wonderful if you could include his cohort as well, which should be incredibly easy. His cohort is a Wayang Shadowdancer, that not even the party knows is there. Cohort lives in (literally) Kesari's shadow (Hide in plain sight, yeaah), and would be great represented as just a wicked grin in the shadow, or a manipulation of the shadow to show the exaggerated nose and smile of the Wayang.